Lately we’ve been taking a look at old Japanese magazines, so I thought I’d continue with that theme. This is one of the ads that ran in Famicom Tsushin magazine in 1994 a few weeks before MOTHER 2’s release. The scan is courtesy of good ol KingDarian, another crazy (as in crazy awesome) collector of MOTHER/EarthBound merchandise. The guy is Takuya Kimura, famous member of the popular boy band SMAP. I think I read somewhere that he and Itoi met on a fishing trip or something and they hit it off. I forget. 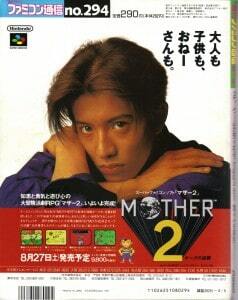 Anyway, he also appeared in the TV commercials for MOTHER 2, and supposedly he owned (owns?) one of the super-rare MOTHER 2 dragon jackets. Also of interest are the screenshots in the corner. The far left shot has the trash can in the wrong location, and the Threed shot is in a yellow daytime-ish palette. It’s also interesting that the ad lists the graphics as a positive thing; over here the game was torn apart by reviewers because of those same graphics. Another weird thing the ad mentions is that there are over 150 events in the game. I… guess that’s good? I never really counted the total number of events in other RPGs I’ve played. In Japan they plastered a Japanese boy band guy all over everything. In America, they made fart jokes and gym sock jokes. What an odd and intriguing difference in marketing approach. Both of those advertising campaigns are awful!! But, at least Japan’s wasn’t telling people that the game stunk, it takes a LOT of guts to do that! Anyways, I accidently zoomed in on Kimura’s eyes, it was SCARY!! Those eyes aren’t right! Hypnotizing you with his Japanese boyish good looks. I don’t even remember the marketing for Earthbound, I live in Canada and just remember renting the game because it had a HUGE box. 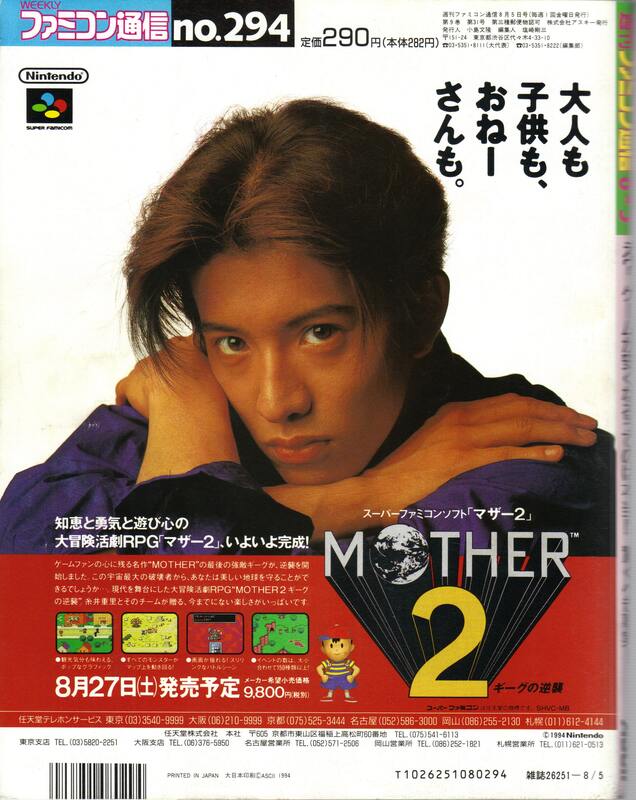 I don’t remember the marketing for EarthBound because I was 2… *Becomes hypnotized by Kimura’s stare* @__@ Wait.. what kind of magazine is this again? My brother rented EarthBound from Blockbuster because of the GIANT box too. I actually hear a lot of people say that. It’s no surprise. You give kids a box full of new candy they’ve never seen before and tell them to pick one, they’re gunna go for the biggest one with the brightest colors. So what’s up with SMAP? I know they were a musical group in like the 80s, but why are they still so big? I just watched the Kamen Rider G parody they did, which was amazing, but why do they have staying power? Replace that guy with Backstreet Boys and EarthBound might have had a bigger success… maybe. Vinny – SMAP is much more than a music group today. I sort of follow them because I like Kusanagi Tsuyoshi because he’s one of the hosts on Pussuma (my favorite Japanese show). So SMAP also has a weekly variety show called SMAPxSMAP where they perform a bunch of horrible sketches with the occasional funny one and they usually do a musical performance at the end (live performance, so they sound terrible). I know Shingo and Nakai used to do a show together and I’m sure other members have many other shows they’re working on too. Then each member stars in a TV drama every once in a while and they each do some movies and they’re all over commercials for anything and everything. They’re less of a music group now and more of powerhouse of everything, really. They have staying power because girls still go crazy for them after all these years. I still think Japanese video game prices are ridiculous. 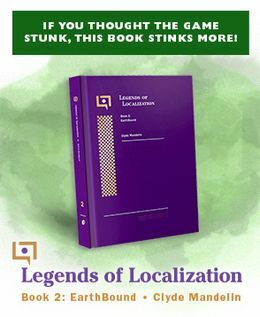 Would anyone have bought Earthbound in NA back in the ’90s if he or she had to pay around $100 for it? Exchange rates were very different back then. 9800 yen in 1994 was about $67. EarthBound cost $69.99, so it’s about the same. European gamers routinely paid that or more for USA games we imported. The American SNES RPG library was several times larger than the European pal RPG library. We never got classics like Earthbound, Mario RPG, Chrono Trigger. So if you think about the sales figures for USA games, a chunk of those are due to international demand.